"Arsenal have won 11 of their last 13 home matches, and wins over Chelsea, Spurs and Manchester United show they can rise to the big occasion." Arsenal boss Unai Emery has won the Europa League three times, winning it every season between 2014 and 2016. Therefore, it's reasonable to suggest he knows how to plot his way through two-legged European ties, and he will be fully aware that his side has to take a lead to southern Italy next week to have a realistic chance of reaching the semi-finals. On the road, Arsenal's propensity for defensive errors and inability to dig in come to the fore a lot more than in the case in north London. Arsenal have lost in Belarus against BATE Borisov and in France against Rennes, but on both occasions they turned the tide in their favour with a dominant display at the Emirates. Arsenal have won their last seven home games in all competitions, and they have won 13 of the last 15. The Gunners have won some big matches at the Emirates. They have beaten Chelsea, Tottenham and Manchester United, and have only been beaten three times on home soil all season. In Emery's time at Sevilla, long streaks of home wins were commonplace. Emery hopes Aaron Ramsey will be fit to start as he continues his farewell tour, while Pierre-Emerick Aubameyang could return to the starting eleven after he was left out of the team for the limp 1-0 loss at Everton. Granit Xhaka and Laurent Koscielny are both battling to be fit, and the return of Xhaka would be a big boost, as the stats show Arsenal's win-rate drops significantly without him. Napoli boss Carlo Ancelotti is a pretty straight talker, so when he says there are "alarm bells ringing" as his side makes the trip to the English capital, that's something to take notice of. In their last two games in Serie A, Napoli have lost at relegation-threatened Empoli and been held at home by Genoa. In the grand scheme of things, those results matter little. Second-placed Napoli won't catch Juventus in the race for the Scudetto, but only a total disaster would see them fail to qualify for the Champions League. However, Ancelotti is concerned by his team's defending. He says they are getting the basics wrong, and failing to control matches. Napoli were beaten 3-1 in Salzburg in the last 16 (although they already had a 3-0 first-leg lead) and they haven't kept a clean sheet in any of their last six matches. They will at least be boosted by the return to UEL action of Kalidou Koulibaly, who missed the defeat in Salzburg because of suspension. Lorenzo Insigne has returned to full fitness, so could start in attack. My overall feeling about this tie is that Arsenal will win the first leg, but Napoli will probably turn things around in the San Paolo next week. The Gunners' home record is formidable, and they have beaten some very strong sides. When they play on the front foot and unleash attacking players like Aubameyang, Ramsey and Alexandre Lacazette, they are tough to stop. Napoli are wobbling a bit at the moment, and although they picked up an impressive 4-1 win Roma recently, there are plenty of weaknesses for Arsenal to exploit. I'll back Arsenal to win here at [2.46]. Arsenal have scored at least twice in ten of their last 11 home games in all competitions, and Napoli are leaking goals. However, I wouldn't be surprised to see Ancelotti's men grab an away goal - they have scored in each of their last ten matches and they haven't drawn a blank in an away match since early February. I'll go for Over 2.5 Goals here at [1.8]. Aubameyang and Lacazette to shine? 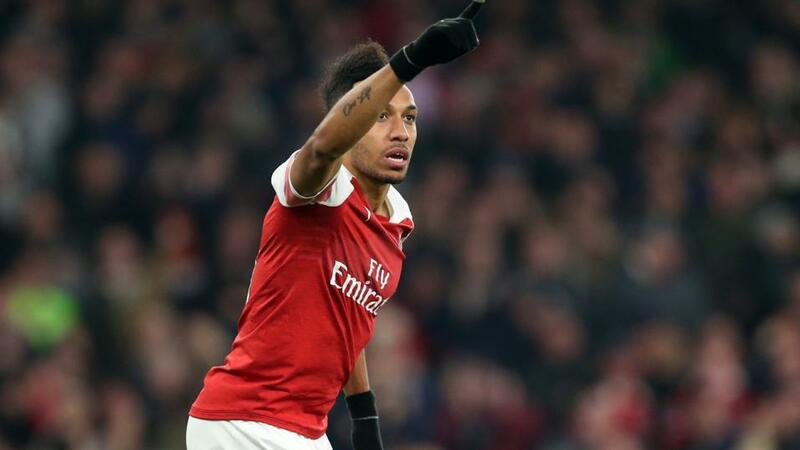 Aubameyang and Lacazette have scored 30 Premier League goals between them this season, and former Borussia Dortmund striker Aubameyang has looked particularly sharp in the UEL. He scored twice in the 3-0 win over Rennes in the last 16, and has four goals in the tournament. Aubameyang is trading at [2.18] to score, with Lacazette [2.48].